The Golden State Warriors received the help they needed to win the pro basketball First Division in 2017-18, their second such championship in three years of the competition. 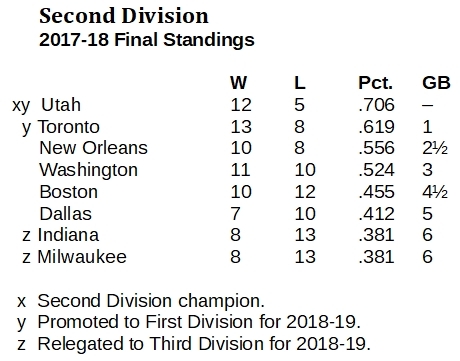 Less than two weeks remained of the NBA season on April 1, 2018, and four games in those final days would tell the tale in the First Division. On that morning, the Houston Rockets led the top division at 14-4, followed by the Oklahoma City Thunder at 13-5 and the Golden State Warriors at 14-6. The defending champs, the San Antonio Spurs were only 10-10 as April 1 dawned, but they were to have a huge impact on this race. They had just knocked the Thunder off Houston's heels with a 103-99 homecourt win on March 29. Later on April 1, the Rockets played in San Antonio, and the Spurs gave them the same treatment, a 100-83 beating that cut Houston's lead over the Thunder back down to one-half game. By knocking down the Thunder and Rockets, the Spurs did quite a favor to the Warriors, who suddenly went to Oklahoma City on April 3 with a chance to take the division lead. They were 14-6, barely behind the Rockets (14-5) and the Thunder (13-5). On a night when Kevin Durant shot pitifully for the Warriors, only nine-for-25 (including two-for-nine from three-point range), he still scored 34 because he was 14-for-14 at the free-throw line. The Warriors won, 111-107, and now led the division at 15-6. One game remained: April 7, Oklahoma City at Houston. 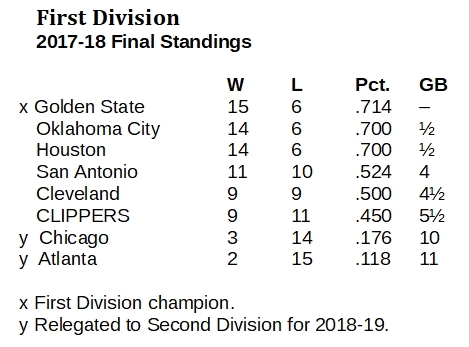 A win for the Rockets on their own court would end their First Division season with the championship. Otherwise, the Warriors would sneak in for their second top-tier title in three years of this exercise. For most of its 10 years in Oklahoma City, the Thunder has worked at around 50 regular season victories and a round or two of playoffs. But the Thunder happened to have a down year in 2014-15 and missed the playoffs. Thus, Oklahoma City began this competition of ordinal divisions in the Third Division when these alignments were begun with the 2015-16 season. But the Thunder rumbled quickly to the top tier. Blitzing through the Third Division with a championship 16-3 showing, it advanced to the Second Division for 2016-17. 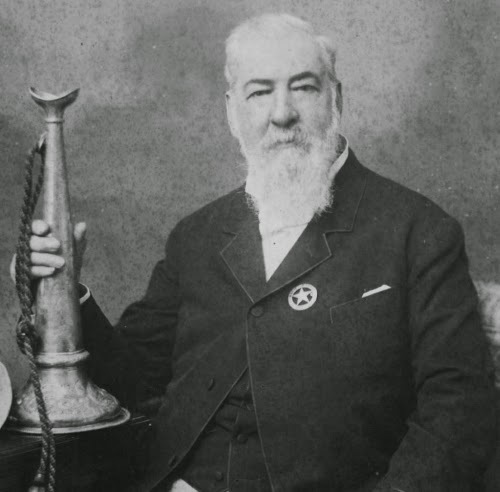 Once there, the Oklahomans fought off challenges from the Dallas Mavericks and Washington Wizards, finishing second to the Clippers and advancing this year to the top level. So, they made it almost to the wire in 2017-18. Falling ever so short, the Thunder relished its role as spoiler on April 7 and hung a 108-102 victory over the Rockets, finishing in a second-place tie with its vanquished hosts at 14-6. The bottom of the First Division was uncharacteristically weak. The Atlanta Hawks, all the way down to 2-15, finished last. The Hawks gave the Spurs their toughest challenge in 2016-17, finishing 1 1/2 games out of first place. Then they lost Paul Millsap and Tim Hardaway to free agency and traded Dwight Howard. Look out below. Right with them, though are the Chicago Bulls, who finished 3-14 and will join the Hawks next season in the Second Division. One promotional spot was up for grabs as of April 1 in the Second Division. The Utah Jazz already were comfortably in the clubhouse at 12-5, clinching the championship and the first promotion. The New Orleans Pelicans were uncomfortably in the clubhouse in third place at 10-8 and needed help. In between, the Toronto Raptors were 11-8 with games coming up against the Boston Celtics and the Indiana Pacers. The Raptors only needed to win one for promotion, and they won both, leaving New Orleans to wait another year. At the bottom of this group, the Pacers and Milwaukee Bucks were clearly the demotees. The standings make it appear that the Celtics and and Dallas Mavericks flirted with disaster, but it only looks like that because the Celtics lost their last two games and the Mavs lost their last three. 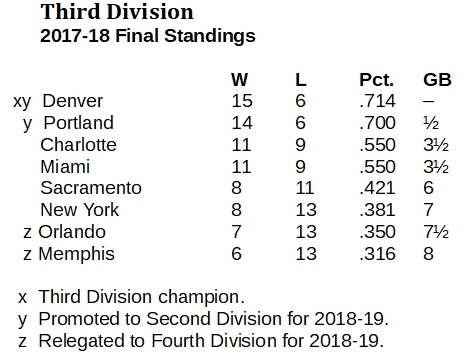 The Denver Nuggets and the Portland Trail Blazers stormed through the Third Division in 2017-18, earning promotion to the Second Division the next season. The Nuggets won the championship with an 88-82 homecourt win against Portland on April 3, holding the Blazers to 13 points in the fourth quarter. At the bottom, the Orlando Magic and Memphis Grizzlies worked their way down. Orlando beat the New York Knickerbockers in April, but that just closed the gap. 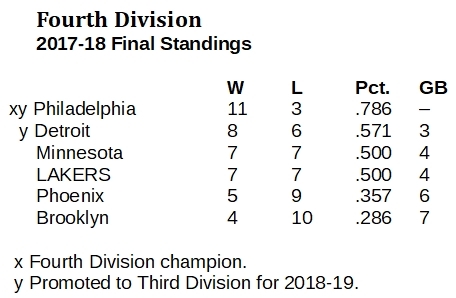 The Philadelphia 76ers easily won the Fourth Division championship with an 11-3 record that was three games better than anyone else in this bottom group. The Detroit Pistons squeezed to just enough better than even to beat the Lakers and Minnesota Timberwolves for the second promotion. The Lakers were in the driver's seat through March 25, second place at 7-5 with their next game coming against the only team seriously chasing them, the 6-5 Pistons. On March 26, the Lakers went to Detroit to play that game, and lost, 112-106. The Pistons, now in promotion position, increased their cushion with a 108-96 win at Brooklyn on April 1. But the Pistons, on their own court, were no match for the Sixers on April 4, losing 115-108. Now, the Pistons were 8-6 and the Lakers were 7-6. Only one game remained, with the Lakers scheduled at home against the Timberwolves on April 6. A Lakers win would make them 8-6, tied with the Pistons. But the Lakers held the tie-breaker, despite their loss in Detroit. They split their two games, with the Lakers beating Detroit, 113-93, at Staples Center on Halloween. Thus, the Lakers won the next tiebreaker, going plus-14 in head-to-head point differential. It mattered not one bit, as the Wolves stomped the Lakers, 113-93, blow torching through a second half that went 62-38 in their favor. So, the Lakers, a cellar-dwelling team for all three years of this arrangement, will try again to move up in 2018-19. It was widely speculated that free agent LeBron James was being recruited for the effort.